1 of 7 Stir sugar into warm water in small cup. Sprinkle yeast over top. Let stand until foamy, 5 to 10 minutes. 2 of 7 Heat buttermilk, egg, salt, honey and butter in saucepan until butter melts and mixture registers 110 to 120 degrees F on instant-read thermometer. Transfer to large bowl. 3 of 7 Add 2 cups bread flour; beat until smooth. Stir in yeast mixture. Add remaining flour, 1/2 cup at a time until dough holds together and pulls away from sides of bowl. 4 of 7 Transfer dough to lightly floured surface. Knead until smooth and elastic, 8 to 10 minutes. Transfer to large greased bowl, turning to coat. Cover with clean kitchen towel or plastic wrap. Let rise in warm place until doubled in volume, about 1 hour. 5 of 7 Punch dough down. Let rest for 5 minutes. Grease two 9 1/4 x 5 1/4 x 2 3/4-inch loaf pans. Divide dough in half; lightly coat halves with flour. Gently pat each half into 7 x 5-inch rectangle. Transfer to the 2 prepared loaf pans. Cover with clean kitchen towel. Let rise in warm place until doubled in volume, about 1 1/4 hours. 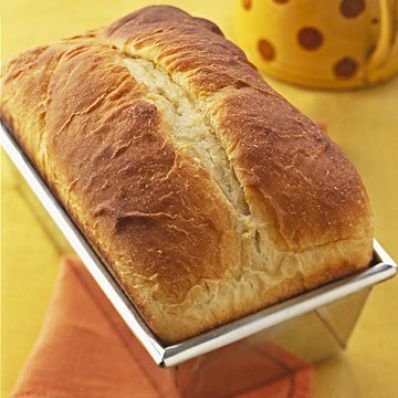 6 of 7 Heat oven to 350 degrees F. With a razor blade or very sharp knife, make a slash down length of each loaf. 7 of 7 Bake in 350 degrees F oven for 15 minutes. Open oven; pull rack with breads out slightly. Brush loaves with some of the melted butter. Bake another 15 minutes. Brush again with butter. Bake another 5 minutes or until loaves sound hollow when tapped. Remove loaves from pans to wire rack to cool.